The desired sound source for a lavalier microphone is a speaking (or occasionally singing) voice. Undesired sources include other speaking voices, clothing or movement noise, ambient sound, and loudspeakers. Balanced low-impedance output is preferred as usual. Adequate sensitivity can be achieved by both dynamic and condenser types, due to the relatively close placement of the microphone. However, a condenser is generally preferred. The physical design is optimized for body-worn use. This may be done by means of a clip, a pin, or a neck cord. Small size is very desirable. For a condenser, the necessary electronics are often housed in a separate small pack, also capable of being worn or placed in a pocket. Some condensers incorporate the electronics directly into the microphone connector. Provision must also be made for attaching or routing the cable to allow mobility for the user. Placement of lavalier microphones should be as close to the mouth as is practical, usually just below the neckline on a lapel, a tie, or a lanyard, or at the neckline in the case of robes or other vestments. Omnidirectional types may be oriented in any convenient way, but a unidirectional type must be aimed in the direction of the mouth. Avoid placing the microphone underneath layers of clothing or in a location where clothing or other objects may touch or rub against it. This is especially critical with unidirectional types. Locate and attach the cable to minimize pull on the microphone and to allow walking without stepping or tripping on it. 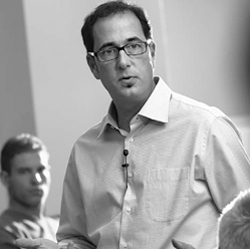 A wireless lavalier system eliminates this problem and provides complete freedom of movement. Again, use only high-quality cables and connectors, and provide phantom power if required. A condenser lavalier microphone will give excellent performance in a very small package, though a dynamic may be used if phantom power is not available or if the size is not critical. Lavalier microphones have a specially shaped frequency response to compensate for off-axis placement (loss of high frequencies), and sometimes for chest “resonance” (boost of middle frequencies). The most common polar pattern is omnidirectional, though unidirectional types may be used to control excessive ambient noise or severe feedback problems. However, unidirectional types have inherently greater sensitivity to breath and handling noise. In particular, the consonants “d”, “t”, and “k” create strong downward breath blasts that can result in severe “popping” of unidirectional lavalier microphones. Placing the microphone slightly off to the side (but still aimed up at the mouth) can greatly reduce this effect. • Do observe proper placement and orientation. • Do use pop filter if needed, especially with unidirectional. • Don’t breathe on or touch microphone or cable. • Don’t turn head away from microphone. • Do mute lavalier when using lectern or altar microphone. • Do speak in a clear and distinct voice. 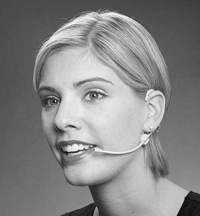 Again, the desired sound source for a headworn microphone is a speaking or singing voice. Undesired sources include other voices, instruments, ambient sound and sound system loudspeakers. Most headworn microphones are of the condenser type because of their small size and superior sound quality. A dynamic type can be used for speech-only applications or if larger size is not an issue. For either type, the frequency response is shaped for closeup vocal with some presence rise. An omnidirectional polar pattern is suitable for most applications, especially if the microphone does not reach all the way in front of the mouth. A unidirectional pickup is preferred in very high ambient noise applications or to control feedback from high volume monitor loudspeakers. For proper operation, unidirectional types should be positioned in front of or directly at the side of the mouth and aimed at the mouth. A windscreen is a necessity for a unidirectional headworn microphone. Headworn designs put the mic element very close to the voice. Balanced low-impedance output is preferred for hardwired setups but headworn types are often used in wireless applications. In that case, the impedance and wiring are made suitable for the wireless system. For condenser types, the bodypack transmitter provides the necessary bias voltage for the microphone element. There are many different headworn mounting designs. Most have a headband or wireframe that goes behind the head, while a few are small enough that they merely clip over the ear. In all cases, the microphone element is at the end of a miniature “boom” or flexible arm that allows positioning close to the mouth. Again, an omnidirectional element can be positioned slightly behind or at the side of the mouth while the unidirectional type should be at the side or in front and aimed toward the mouth. The main advantages of the headworn microphone over the lavalier are greatly improved gain before feedback and a more consistent sound level. The increase in gain before feedback can be as much as 15-20 dB. This is completely due to the much shorter microphone-to-mouth distance compared to lavalier placement. The headworn can nearly rival a handheld type in this regard. In addition, the sound level is more consistent than with the lavalier because the headworn microphone is always at the same distance to the mouth no matter which way the user may turn his head. • Do adjust for secure and comfortable fit. • Don’t allow microphone element to touch face. • Do use pop filter as needed, especially for unidirectional. • Do adjust vocal “dynamics” to compensate for fixed mouth-to-microphone distance. Editor's Note: This is an introduction that Jonathan wrote for his church's audio engineering team. It's a basic introduction, but in those basics, it's going to be helpful, particularly to volunteer sound guys or sound guys at smaller churches. Thanks, Jonathan, for the good material, and for permission to use it! This is one of the most important parts of running sound. A good mix has basically three sound level layers. The top is the loudest, and the bottom is the softest. When you listen to a CD that represents our musical style, the main instruments you hear are drums, electric guitar, and bass. If you listen closely you will hear acoustic guitar and pad/organ...but those are mainly to fill in the gaps. You wonʼt really hear them that well...only when everything else has cut out. Then the main vocal or any other instrument solo should be clearly heard and understood above the rest of the layers. • Every few minutes you should evaluate your layering. • Is the top layer clear and distinguishable? • Are the middle layer elements properly balanced. • Are the bottom elements barely audible? • Then adjust as necessary. When youʼre running sound youʼll want that sweet low end coming through the system. The proper balance between the kick (bass) drum and the bass guitar is critical to this. Typically you want the bass guitar just under the kick drum. The bass guitar provides a critical musical element while the kick drum provides the rhythm that people feel. Without the bass guitar properly mixed in, the music will feel empty no matter how much kick drum you put into the mix. Itʼs also important to remember that some times people will say there is “too much bass”...but that does not mean bass guitar. Most people donʼt realize the difference between kick drum and bass, or they canʼt distinguish between the sounds. Typically lowering the kick drum will satisfy bass complainers. Never let the snare or kick get lost in the mix. They should be clearly heard. The snare gives people something to clap to and the kick gives them something to tap their foot to. Myth 1: Sound is subjective. Each person can run it differently. To a small degree this is true...but the style of music that the worship leader is producing dictates the way the sound is run more than the sound technician. Rock and roll has a different sound than Gospel music...but the musician determines the sound. A good sound guy makes it sound like the musician wants it to. Myth 2: A sound guy is supposed to make the band sound good. The sound guy is supposed to accurately reflect what is happening on the stage. Because different people have different preferences, what sounds good to the sound guy is not necessarily what sounds good for the musicians. Myth 3: A sound guy should constantly be adjusting the levels. If youʼre constantly adjusting the levels, you are micro-managing the band. The only time you should constantly adjust levels is when you have musicians or vocalist who are not consistent with their volume. In house-of-worship sound system installations, one of the biggest challenges is miking the choir. We want to achieve a good balance, a natural sound, and high gain before feedback. Another goal is to make sure that the microphones are invisible! It’s a tough assignment. What mics work well for the choir? Where should the mics go, and how many are needed in each situation? The suggestions that follow should point you in the right direction.. The most popular type of choir mic is a small hanging mic. A few of these tiny microphones can be hung over the choir from the ceiling, from rafters, or on stands. They’re almost invisible when viewed from the congregation. Choir mics are condenser types with a cardioid or supercardioid polar pattern. These patterns reject feedback yet have a wide enough pickup for good coverage of the singers. Condenser mics can be made much smaller than dynamics of equivalent bass response. An example of a miniature choir mic. Choir mics are built in three parts: mic head, cable, and power module. The mic head puts out an unbalanced, medium impedance signal which travels through the long cable. At the far end of the cable is a power module with an XLR connector or a terminal block. The module accepts phantom power and sends DC to an FET near the condenser mic capsule. Also, the module equalizes the mic signal and converts it to low-Z balanced. In some choir mics, the power module takes the form of a flat plate that is mounted in the ceiling. In other mics, the module is a tube with an XLR-type connector. When placing mics to pick up the choir, a critical factor is gain before feedback. To get enough gain, you must to mike the choir much closer than you would for recording. Place the mics about 18 inches in front of the first row of singers, and about 18 inches above the head height of the back row (See Figure 1). The mics are raised to prevent overly loud pickup of the front row, relative to the back row. The rows are equidistant from the raised mics, giving a well-balanced sound. To achieve uniform coverage, use one microphone in the center of every 20-foot span of singers. A choir of 30 to 45 voices should need only two or three mics. Given a fixed miking distance, you’ll get less feedback with fewer microphones. You might want to mount the choir mics on tall boom stands to experiment with placement during choir rehearsals. Once this is done, hang the mics permanently. In miking a choir, it might seem important to consider the 3:1 rule. When multiple mics are mixed to the same channel, the distance between mics should be at least three times the mic-to-source distance. This prevents phase interference between mics (comb filtering), which is a series of peaks and dips in the frequency response - a colored, hollow sound. The 3:1 rule cannot be applied to miking a choir with a few mics. Why? Most of the singers are somewhere between the mics, and those singers will be picked up with some phase interference. However, since each singer is in a different position relative to the mics, each singer is heard with a different coloration. The effect averages out over all the singers and so is not very audible. Once the mics are placed, you need a way to hold them in position. Mic cables can lose their orientation as the mic cable uncoils over time, or the mics can swing back and forth in a breeze. 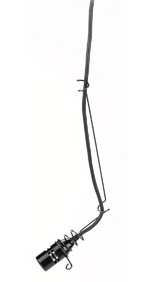 Some choir mics have a built-in hanger which comes with a tiny crossbar or pipe. You thread a fish line through this pipe and attach the line to screw hooks in the side walls (See the example photo of a miniature choir mic above to view how this should look.). The guy wire keeps the mics oriented toward the choir. If hanging mics is not an option, you might try making some clear plastic mic stands of Lexan corner molding. The stands can be cut to the desired height and mounted to or near the choir rail. What if the choir is under a balcony? Try mounting some supercardioid boundary mics to the bottom surface of the balcony, near its front edge. Monitor loudspeakers can easily feed back into the choir mics. To keep feedback under control, try not to use monitors near the choir. Instead, turn up the house loudspeakers. If the choir insists on monitor loudspeakers, don’t feed a monitor signal of the choir back to them because it will cause feedback with the choir mics. Rather, just feed them some music for accompaniment. If the choir members complain they can’t hear themselves, maybe the piano, organ, or music tracks are too loud in the choir monitor speakers. Have the choir sing a capella, with the air conditioning turned off. Can they hear themselves? Now turn on the air conditioning. Can they still hear? Turn up the piano or organ in the choir monitors. Then turn up the tape tracks. At what point can the choir no longer hear their voices? Turn down the offending sound source. In some venues the choir mics pick up too much of the organ’s sound. 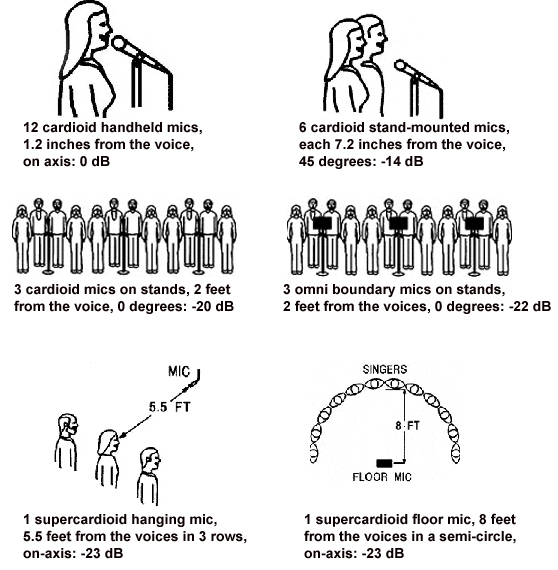 In this case, use supercardioid mics and aim them toward the middle row of the choir. Because the mics partly reject sound from the side, they will pick up less of the organ in this configuration. If the organ is still too loud, aim the mics straight down over the choir and filter out frequencies below 100 Hz in the choir mics. Suppose you want to mike a small choir of about 12 people. Of course, you want the most gain-before-feedback possible, but you also want to keep the number of mics to a minimum, both to reduce cost and to simplify mixer operation. Should you use one close-up mic per person? One mic on every two people, or one every four people? How about one mic on the entire group? GBF drops 3 dB every time you double the number of open mics. GBF drops 6 dB every time you double the miking distance (not including proximity effect). Directional mics have more GBF than equivalent omni mics. With directional mics, on-axis sound sources produce more GBF than off-axis sources. The results of these calculations might surprise you. Figure 2 below shows several mic techniques and their calculated GBF, from best to worst. Note: The GBF of 12 close up mics was normalized to 0 dB. What do the results show? If a facility can afford 12 mics, and can handle that many on the mixing console, go for it - 12 close-up mics give the best GBF, by far. If six mics make more sense, you save cost and complexity, but give up about 14 dB GBF. That’s not necessarily a problem, depending on the venue, mics, and loudspeaker placement. 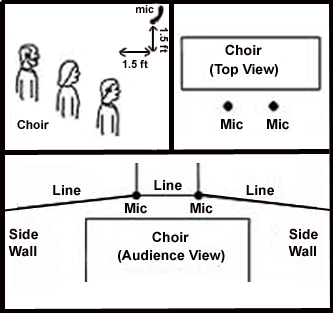 When using six mics to pick up 12 people, the singers must be relatively far from the mics, and about 45 degrees off axis in relation to them. So six distant mics have much less GBF than 12 close-up mics. If the customer wants the simplicity of a single mic on the choir, try either one hanging supercardioid mic or one floor-mounted supercardioid mic. Either should provide about 23 dB less GBF than 12 handheld mics, but this approach could work suitably anyway. All of this is theoretical, and assumes that the mics have textbook polar patterns. Your real-world results may vary! But these findings might suggest some tendencies helpful to know. For recording and/or broadcasting a choir in a live setting, three types of mics have proven to work well: cardioid condenser, omni condenser, and stereo condenser types. A stereo pair of cardioid condenser mics is shown in Figure 3. This array reduces pickup of audience noise and room acoustics, and tends to provide sharp imaging. If mono compatibility is important, use two hypercardioid mics, angled 90 degrees apart, with their grilles almost touching and aligned vertically. This will prevent phase interference between the mics. A spaced pair of omni condenser mics is a good choice if you want stereo images to be blended rather than pinpointed. Omni condensers have superior low-frequency response, so they also excel at reproducing a pipe organ. A stereo condenser mic combines two mic capsules in a single housing, for convenience. One stereo mic generally costs more than two mics of comparable quality. A special type of stereo mic is called “mid-side.” It has one mic capsule aiming straight ahead toward the middle of the choir, and another capsule aiming to the sides. In a mid-side stereo mic, you can adjust the stereo spread by remote control. Mic placement for recording must be determined by ear as the choir rehearses. Experiment with a pair of mics, or a stereo mic, on a tall stand. Once you’ve found a good-sounding mic position, hang the mics there. 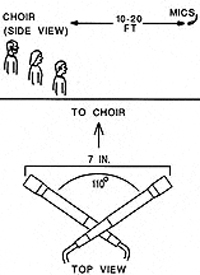 Start by placing the mics about 12 feet from the choir. Raise them a few feet above the heads of the back-row singers, and aim them down at the choir. The setup shown in Figure 3 provides excellent stereo. For convenience, you might want to mount both mics on a stereo bar or stereo mic adapter. This device mounts two microphones on a single stand. A good starting position for two spaced mics is about 3 feet apart and 12 feet back. The wider the spacing between mics, the greater the stereo spread. But too-wide spacing results in an exaggerated left-right effect. Figure 3: A near-coincident stereo mic technique. After setting up the mics, it’s time to fine-tune miking distance. The farther the mics are from the choir, the more room acoustics you’ll hear in the recording. Listen to the mics’ signals, using either headphones or loudspeakers in a separate room. If the choir sounds too distant and muddy, move the mics about a foot closer and listen again. f the choir sounds too close, without much room sound, move the mics farther away. Note: if the hall is acoustically “dead” (lacking reverberation), you might prefer to add artificial reverb. Use a digital reverb unit patched into the effects loop of your mixing console. If the organ overpowers the choir, or if air handling is noisy, you’ll have to close-mike the choir and add digital reverb. Ideally, you’d use distant mics for recording and close mics for PA. But suppose you’re limited to just the PA mics. Since PA mics are closer to the choir, their recorded sound will lack ambience unless you add some artificial reverb. 1. Connect buses 1 & 2 to the PA power amp inputs (or to the graphic EQ inputs). Connect busses 3 & 4 to the recorder line inputs. 2. Assign all mics to buses 1, 2, 3 and 4. 3. Connect the reverb returns to buses 3 & 4 (input). 4. Turn up the choir mics’ effects sends while monitoring the recorder output. You also could record “dry” to multitrack, then add reverb during mixdown. Try out these techniques, and feel free to experiment with your own techniques too. In time, you’ll enjoy a beautiful choir sound for both recording and PA applications. From ProSoundWeb, used by permission. 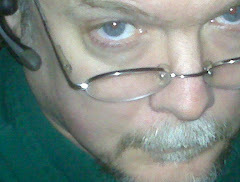 AES and Syn Aud Con member Bruce Bartlett is a recording engineer, microphone engineer and audio journalist. His latest books are Practical Recording Techniques (5th Ed.) and Recording Music On Location.